Well, I’ve just realised that although she is my number one co-author and she’s been mentioned a number of times on my blog, I have never really written about my dear little Amber’s story here. I guess it’s because I wrote about Sidney once, having started the blog after she died. Birding and blogging was something that helped me get through losing her. One of the first times I finally left the house after she died was to go for a birding walk and I remember how watching chickadees hop around in the trees and mallards at the lake brought me some tiny morsels of happiness again. I felt my spirit lift just a little bit. Its been two years now since Sidney died. Not long after that, Amber showed up unexpectedly. It’s a long story, but she’d been the neighbour’s cat and she had basically lived outside most of her life. She’d had free rein to go in and out and she pleased through her cat door, but spent most of her time outside. We wound up finding her with her eye crusted shut and seeming to be in pain as a result. I took her in to the emergency vet (of course it was a Saturday! ), where I’d last been with Sidney when she was diagnosed with cancer. Just being in the waiting room and going in the same exam room brought all the memories back. It was not easy, but I had to help Amber! Amber was diagnosed with a corneal ulcer. Ouch! Treatment involved wearing a cone to prevent her scratching and damaging the eye further, pain medications and eye drops three times a day. And staying confined inside for at least two weeks. Soon, after a check with her regular vet, two weeks became a month so it could fully heal. You just don’t mess around with eyes! Amber hadn’t used a litter box since she was just a wee kitten and at this point, she was 11 years old. She’d probably never had to stay inside for a whole month before. While I was still deep in grief over Sidney’s death, I now had a completely different kind of cat to take care of. At first, it was not easy. I filled up the litter box with dirt and leaves from outside to make it more like the outdoors she was used to. She picked it up pretty quick after that. I tried taking her outside on a leash to let her get some fresh air and grass she was used to, but she wasn’t the ideal candidate for leash training after being free-range for so long. She tried to dart away many times and I worried it stressed her out too much, so I shelved the idea. We let her out of the small room as soon as she mastered the litter box, and she started getting comfortable with the rest of the house, and us. I think she warmed up to me a little more slowly; probably because I got upset every time she sat in Sidney’s bed or did something that reminded me of her. It wasn’t easy; I wasn’t anywhere near being ready for another cat and I’d planned to take some time before adopting another. But life throws us the unexpected sometimes. She still meowed at the door to be let out and tried to escape every time we came and went, but she came leaps and bounds from those first few nights. Once she was better, I hesitatingly let her back outside. I worried about her getting in trouble, hunting, getting cold, all the bad things that can happen to kitties outside. Mostly, she proved to be a smart cat from all her years outside. I never let her out at night despite her cries. She came back to our house to eat and slowly, over time, she started spending more and more time inside with us. With her little scratchy meows and headbutts (and being a cat), of course, I fell in love with her. The first summer she was with us, she presumably got into a fight with another cat. I got home and saw one of the neighbourhood regulars darting away through the front yard and then found Amber crouched down on the ground making a strange meow. I didn’t realise anything was immediately wrong until I brought her inside and picked her up. My partner yelped that she was bleeding and I took action, immediately going for my pet first aid kit. As I waited at the hospital for her to get stitched up, I cried and cried, only realising then just how much I loved her. Again, I was her nurse, giving her medications and taking her to her check-ups and soon, she became my baby, too. She’s a very different cat than Sidney; being quite adventurous going outside, totally content to hang out on her own but also enjoys being near people, too. Unlike Sidney, she is a spry 13-year old now. She has her own personality; she loves climbing up high, she loves getting head scratches and she loves pushes around boxes like a bulldozer. She is quite talkative and her favourite colour is purple. Now, she sleeps in our bed every night. Two years ago, I would never have predicted that. She wanders a lot less than she used to and spends a lot more time inside than outside now. She’s stolen our hearts, too, and I wouldn’t have it any other way! Looking after her helped me heal from Sidney’s loss, even though it wasn’t always easy, I will always be thankful for that. I am so glad she accidentally wound living with us and becoming our beloved kitty! Just about a month ago, I said goodbye to my little foster kitty, Zip. She was my first one and she absolutely stole my heart. It was bittersweet saying goodbye between losing this little girlie I had come to know and love but happiness knowing she was going home to a wonderful family. In fact, I am so grateful and overjoyed that she found a family who will look after her with love and care, and give her everything she needs. Because of her special needs, I worried she would never find a good home. Well, I was wrong, because obviously they could see how sweet and lovely she is! I spent lots of time with her while she was in my care. I got to know her different mews, where she liked to be scratched and what games and toys she liked the most. She cuddled up to me in bed every night, purring like a nonstop motor, sometimes licking my hair and wrapping herself around my head. She grew so much under my care and got a lot healthier being in a home. She has such purr-sonality and she is so gentle, but equally very playful and excitable. Every night around bedtime, she’d get her energy and run back and forth and jump on all the furniture. She jumped like a fox on all fours, pouncing unseen prey. So bright and beautiful and always ready for the camera, my inquisitive little one. Just like every other cat who seems to come into my life, I will love her forever. I think of her often, some days more than others. I will never forget her and cherish my memories. We celebrated her first Christmas and her 6 month birthday! Her family has updated me to say she is very happy and I think fondly of her at home with her family and new kitty brother, who is her newfound b.f.f.! She always loved other cats, it was a shame my own cat did not get along with her. Last week, I took home my first ever foster kitten. She was a little bit sick for a while and stuck at the kitty hospital for some time, so coming to my house was the first time she got to run around in a while. She is a beautiful girl and a real lovebug! Its safe to say it didn’t take long for her to steal my heart. As playful and energetic as she is she is also every bit just as loving and cuddly. She has a pretty loud purr for such a small cat. Every night, she cuddles up with me in bed and one day I woke up in the morning to her grooming me. Cuddling up to me. She is not camera shy! Its funny watching the differences and similarities between her and Amber. my senior kitty. They both like the same toys, but they move at different speeds. But they both kick the toy the same and chase after it, though Amber is only a little bit less exuberant about it. Having Zipper around is also distracting – I’d rather just hang out with her than do most other things! Amber is super sweet until she meets another cat. 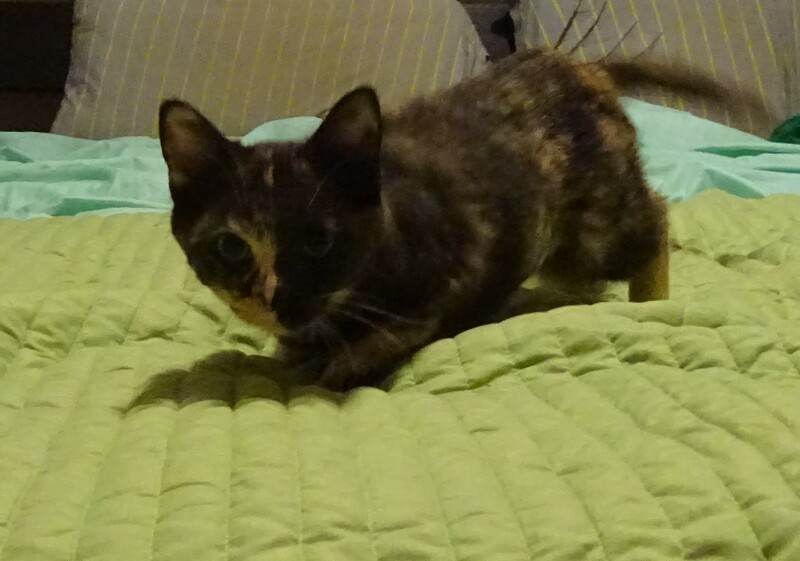 She was the original calico in this house. I recently shared my story of my beloved cat Sidney, who had hyperthyroidism and later suffered from terminal cancer. I thought I would share what I learned about her over-active thyroid with you in hopes of encouraging people to consider adopting special needs cats and being aware of the signs of hyperthyroidism in your cat. My little Sidney in one of her favourite spots. Sidney led a normal life for years with hyperthyroidism. What happens if my cat has an over-active thyroid? This disease commonly affects senior cats. If your cat exhibits any symptoms of hyperthyroidism, you should discuss your concerns with your vet. If hyperthyroidism is left untreated, it can cause kidney and heart failure, both of which may ultimately be fatal after your cat suffers with the illness for long enough. There are a number of treatments available, including regular medication, surgery and radioactive iodine therapy. How do I know if my cat has hyperthyroidism or another chronic disease? The best way to keep your cat healthy is by preventative care and regular vet check-ups, the same as humans. Visiting the vet for an annual check-up is vital to finding any early warning signs of disease. Once your cat reaches senior age (10+), they should visit the vet every six months for senior check-ups. Hyperthyroidism can be diagnosed with a simple blood test. Other common illnesses striking senior cats include chronic kidney disease and diabetes. What else should I look out for in my cat? Cats naturally hide it when something is wrong and they may only show signs of illness when a disease has already significantly progressed. If a cat is not eating, it is very likely something is wrong. If a cat does not eat for more than 48 hours, they are at a very high risk of contracting a liver disease called hepatic lipadosis and must see a vet right away. If your cat exhibits any of the following signs, you must seek immediate veterinary care. Always know what vet hospitals are open 24/7 or are available on-call 24/7 in your area in case of an emergency. Always have copies of your cat’s medical records in the event you need to see an emergency vet. If you are out of town, be sure to leave this information with your cat sitter. NEVER give your pet any kind of human medication unless specifically instructed to do so by a veterinarian. Many medications for humans are extremely toxic to animals. I would encourage you to take a Pet First Aid course. It could save your pet’s life. You will learn how to take basic vital signs (heart rate, respiratory rate, body temperature), basic preventative care, how to recognise common diseases and treatment as well as wound care and the common vital signs of an emergency. Sidney, until recently, was my beautiful and beloved senior cat with whom I was lucky to share one very special year. Its taken me some time to be able to write about this because I wish it had been more than a year, because its emotional, close to my heart and a little more personal than I’d like to get on this blog. It devastated me when she passed away in December. Even now, it is difficult to write. My beautiful Sidney came into my life unexpectedly. I have been a great animal lover my whole life, but there is something so special I love about cats. I always wanted one. But between moving every couple of years and being a student, I was never able to adopt a cat of my own because I believe in forever homes and being financially capable of supporting a pet. One of her favourite past-times was snuggling in bed, especially with mom. Sidney was 12 when I met her, or about 65 in “human years” and had hyperthyroidism, or an overactive thyroid. We adopted her from a neighbour and I was utterly happy. Even though I know how much I love cats, I never expected this little tuxedo cat to steal my heart the way she did. Sidney was a true people cat. She loved the company of people and soon enough, she followed me around the house and was always in the same room as me. One of her favourite past-times was sitting on laps. She would sit on mine for hours if I let her and sometimes we just sat together, her and I. She would purr happily as soon as she was in my arms and, unlike most cats, loved being picked up and cuddled. She was so different from every other cat I’ve known and I don’t expect to meet any like her again. Her beautiful and wise green eyes held a deep understanding. Her eyes held this wisdom in them, like she completely understood me and sometimes I would just talk to her and she would patiently listen. When I was sick, she laid on my bed with me all day. When I was sad, she would snuggle up to me. During some tough times and periods of unemployment and the anxiety that comes with it , she was a constant in my life and she gave me a much-needed sense of purpose. We developed quite a bond, and our neighbours told us she was a calmer, happier cat around me. It seems we both needed each other. Her hyperthyroidism would qualify her as a “special needs” cat to most, but to me, she was just special. Its a common ailment in older cats and we managed it by giving her anti-thyroid pills (Felimazole) twice a day. If it sounds challenging to give a pill to a cat, I can honestly tell you it really wasn’t, but she was pretty agreeable. We gave it to her in a tiny bit of yogurt or rolled up in a bit of wet food, or the easiest of all, in a Greenie’s Pill Pocket. Exploring outside, she was like a kitten again following mom around the yard and playing in the sun. However, in November last year, she had lost noticeable weight and was eating much less. Food was one of Sidney’s great loves in life, so I knew something was wrong. The vet found her thyroid was still too high, so we increased her medication. But they had also found a lump in her abdomen and we scheduled a followup in another week. I could never have prepared for what happened. During that week, we rushed her to the hospital when she started open-mouth panting (a critical sign to go to the vet NOW for any cat), we found out she had cancer that had spread to her lungs. It broke my heart, both knowing it was terminal and fearing she was in pain. Sidney often curled up and slept here at the foot of the bed with mom and dad. Here she is modelling for me in one of our many photoshoots. Sidney stayed in the hospital overnight so she could be stabilized and have fluid drained from her chest cavity, which had caused her difficulty breathing. The next morning, we picked her up and spoiled her extra, and started prednisolone treatment for palliative care. It was suspected lymphoma, and this treatment often slows the cancer and gives them more time. Unfortunately, Sidney did not have much more time. A week later, she was having breathing difficulty again, and I knew what it meant. I’d pre-planned a list of possible vets who perform at-home euthanasia and reluctantly called. We had a vet come to the house and Sidney passed away at home, in my lap, a very favourite spot on December 21. It was, quite literally, the darkest day of the year. I’m not sure I’ll ever fully get over her loss. She was one extraordinary cat. My dear cuddlemuffin and best friend, Sidney, I hope you are running free in the sun now. You will be forever in my heart. Sidney was my best friend, my little shadow who followed me around and my cuddlemuffin. Words don’t express how much I loved her. She brought us so much joy, happiness and love and we were so very lucky to share a special year of our lives with her. Senior cats are very special and need loving homes, too. I realise it is kitten season, but please, please consider giving a loving home to a senior cat who desperately needs comfort, happiness and love in their last years of life. If they have special needs, find out what needs to be done. It could be as easy as a pill pocket once a day. You, too, may end up with a beloved friend like Sidney. Washington State University Veterinary Medicine Grief Phoneline: 1-866-266-8635, talk to a veterinary medicine student who is trained in grief counselling for free. The Pet Loss Support Page: if you prefer to write rather than talk about your experience and feelings to seek support from others who have lost a pet, too. There are many websites out there dedicated to pet loss, do a google search to find the right one for you. Suicide Prevention Hotline: 1-800-784-2433, if you are unable to cope and having thoughts of suicide, please call this number or go to Suicide.org to find a local number to call in the U.S. or internationally. Other ways to cope may include writing a blog post, making a scrapbook, creating a video of your pet or holding a memorial service. If you know of other good resources, please leave a comment with a link. Remember it is perfectly okay to grieve for your pet. Don’t let those who don’t understand bother you. It can be extremely difficult to lose a pet because, unlike a person, they love us unconditionally no matter what, they do not judge and they are big part of our daily routines. Its a special kind of love not found in other relationships. Why your pet should have ID – especially your indoor cat! Have you ever seen a cat wandering around a neighborhood and wondered if it might be lost? Have you ever seen a dog wandering a neighborhood and known it was lost? That is quite a difference between lost dogs and cats and staggeringly low numbers of cats with identification. As a quick experiment, I tallied up the lost cats on a local facebook page and came up with: 79 cats were lost from October to December 2015. Of those 79 reported lost, only 18 were reported found. That is a 23% success rate. Of course, it is likely some of those cats were later found and not reported so the actual number is probably higher. But its still disheartening. Fortunately, you can get your cat identification to increase their chances of them returning home in the event they are lost. This kitty frequents my backyard and I have no idea who he belongs to, if anyone. Microchips are usually inserted under the skin between the shoulder blades, no anesthesia required. The chip contains a unique registration number not unlike a barcode that can be read with a scanner. The most important step is to register your pet with the microchip company and provide your updated contact information with it. Read more about microchipping from the Humane Society. Tattoos are often done inside the ear and are a special code which will be registered with your pet’s details (color, breed, health issues, required medication, anything else relevant), their vet and your contact information. Keep in mind microchips and tattoos are not magical cat locator beacons or GPS trackers. The information associated with the unique tattoo ID or microchip MUST be kept updated. If you move or change phone numbers, you must update the information with the database or pet registry that has your pet’s information. A collar with a tag is a really great thing to have even if your cat has a tattoo or microchip. That way, if someone finds your cat, they can call your number right then and there and check with you directly if kitty is supposed to be outside or not. Because of the direct link the finder can make to the pet parent, I think collars are a great option. So does the Humane Society! Yet another un-collared cat in my neighbourhood. While many people think that their cat will never adjust to wearing a collar or will fuss or be picky about it, give it a try and you’ll be surprised. I was told my neighbour’s cat would never wear a collar and would manage to get out of it. Three months after giving her a collar, she is still wearing it today. And in fact, a study on 538 cats found 73% of cats successfully wore their collars over the six-month study period, much to the surprise of their parents. If you do get your cat a collar, make sure it is a breakaway collar! If your cat gets their collar stuck on a branch or gets their leg stuck in it and they do not have a breakaway collar, they could strangle to death or get seriously injured. A breakaway collar, however, is designed to “break away” – the buckle detaches if the cat gets stuck and yanks away, thus allowing them a safe escape. Also be sure you know how to properly fit the collar. This guide has excellent advice and a video on how to correctly fit a collar on a long or short-haired cat. If you have an indoor cat, consider getting him or her an orange collar as presented by the Kitty Convict Project. That way, if kitty escapes, people who find him will hopefully know he belongs inside. Or you can have “indoor-only” engraved on your cat’s tag. It is so important for indoor cats to have ID as it is the best way to get them back home safely. Does your cat wear a collar? Do they have other ID? If not, please think about it! Don’t let your pet become another lost pet statistic. Ask your vet about it and check with local humane societies or rescue groups. They often offer special pricing for microchips or tattoos. Collars and tags are relatively cheap. My local animal pound offers engraved tags for free. Its worth checking if maybe your’s does, too. Are you prepared for your pet’s care in a disaster or evacuation? I love animals and pets and I am sometimes more aware of natural hazards as an earth scientist than other people. Combine the two and you get pet emergency preparedness. I’d been planning a post about this, and in light of our recent Mw 4.8 earthquake in Victoria (which I admit scared me! ), I thought it was a good time to post about this. Getting pet first aid certified and living near a plate boundary has definitely made me more aware of what to do for my pet in case of emergency. In fact, I will openly admit my pet first aid kit is better than my human one! No matter where you live, some kind of natural disaster could hit. Whether its an earthquake, tornado, blizzard, volcanic eruption, flood or a hurricane, you should always be prepared. Prepare an emergency kit and an evacuation plan for yourself and your family. It pays to prepare for these things, and maybe you have. But have you thought about your pets? If not, make sure you do! No matter where you live, there could be an earthquake, tornado, blizzard, flood, and you have to have a plan not only for yourself and your family, but for your furry friends, too! You won’t always know when its coming, so its best to always be prepared in case the worst happens. After the Christchurch earthquake in 2011, hundreds of cats were heart-breakingly abandoned and left homeless. To read more about them and how they are being rescued, take a look at Red Zone Cats . Its the same story following the Japan earthquake in 2011 and the subsequent Fukushima disaster. The Japan Cat Network is striving to help lost pets and those left behind in the areas affected by radiation. The most important thing to remember is never leave your pet behind if you are evacuated. If it isn’t safe for you, it is NOT safe for your pet! Carrier/crate – you should actually leave this out for them all the time, so they can get used to being around it. Be sure to practice putting your pet in their carrier ahead of time. Extra food and drinking water in a handy backpack or rolling suitcase. A can opener if cans are not pop-tab cans. Extra medication if your pet requires any plus whatever you use to administer it to them (like pill pockets). This is very important if they have a chronic condition! For a cat, have extra litter handy and a litterbox or cardboard box to be used as a litterbox, as well as a scooper and garbage bags. For a dog, have an extra leash and collar on hand to get them out of the house quickly. They’ll need to go for a walk after you evacuate, after all. Its not a bad idea to keep a muzzle on hand as well in the event you need to restrain your dog. Plastic bags for poop scooping. First aid kit – You can buy one at a local pet store or assemble one following the guidelines from the Humane Society and the American Veterinary Medical Association. Plus: Consider getting pet first aid certified. It made me a lot more confident in caring for my cat and I guarantee you will learn something you didn’t know. Check with your local first aid providers if they offer a pet course, ask a local pet store or animal shelter, or google “pet first aid + your town”. Address, phone number and contact info of at least two pet-friendly hotels in your area in the event you have to evacuate with your pets and stay in commercial accommodation. Copies of your pet’s medical history. Its a good idea to have this in case of an emergency in case you ever need to take them to the hospital (and I hope you don’t). Make sure you plan for a secondary care-giver in the event you are not able to get home to care for your pet. Make sure they have a key to the house, know where all food, medications and emergency supplies are kept. Printed photos of your pet in case they go missing. Putting up photos and missing posters in your neighbourhood is one of the best ways to find a missing pet. Make sure your pet has ID! Microchip, tattoo or a collar ID tag. More than one is even better. It is so important to have your pet’s name, your phone number (and/or address) and if they require any medications engraved on the ID tag so when found, you can be contacted and they can get proper care. Get a sticker for your door in the event of emergency, please rescue my cat. Such as this one (free) from the ASPCA. Consider looking into pet insurance. If your pet is young and healthy, this may be good for covering unexpected pet costs in the future. I ultimately decided my cat was too old for it to be worth it, but if I ever got a young pet I would definitely invest in insurance. Canadian Disaster Animal Response Team Be Prepared!